United Yacht Sales New Jersey would love to guide you through a personal showing of this 48' San Juan 48 Express 2008. 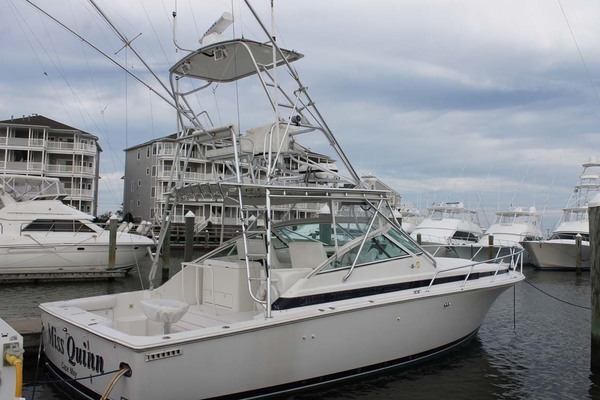 This yacht for sale is located in Hampton, Virginia and priced at $849,000. For a showing please contact us by filling out the form on this page and we will get back to you shortly! The 48 San Juan is designed to be a safe, comfortable, high-performance motor yacht, engineered to handle the rugged environment of it's birthplace, the Pacific Northwest in style. The hull design makes this lobster yacht/express cruiser capable in a broad range of sea conditions, while allowing for fast cruising in calm to moderate seas. The San Juan 48 is 51'10" overall, 48' Length on Deck, with a 15'6" beam and 2'9" draft. Efficient and highly functional interior and exterior layout has created a premium level of living space suitable for intimate family use as well as for entertaining. The large cockpit has ample room for sitting/dining/sunbathing and fishing. The pilothouse includes a settee area and helm seat with a hydraulically operated sun roof above and large scratch resistant removable rear windows opening onto the cockpit. The galley is outfitted with a cooktop, microwave/convection oven, refrigerator, freezer and dishwasher, The cabinets and counter behind the helm station contains a bar sink plus drawer type refrigerator, freezer with icemaker. A combination washer/dryer is located beneath the steps to the lower cabin, the steps are hinged and easily lift to provide access to the laundry area. Forward and aft staterooms are both outfitted with Queen sized beds. The forward stateroom features a private head and shower, while the guest stateroom shares the Day head, also with a stand up shower. The guest stateroom can be converted into a settee for day/ casual seating use. Above the berth is an upper "stow away" berth for one person. There is additional storage beneath the Forward and guest berths. The Pilothouse and lower cabin are heated and cooled by a Chilled Water HVAC unit (Replaced with new unit in 2017) .